Stephen Altrogge. The Greener Grass Conspiracy. First of all, a huge thank you to Crossway for sending us bloggers a pre-release copy of the book, and for giving each of us the opportunity to write a review! There is a conspiracy afoot, and it’s aimed at each one of us. The conspiracy is a device of our own sin, the world and the devil, and is a mortal danger for Christians and non-Christians alike. 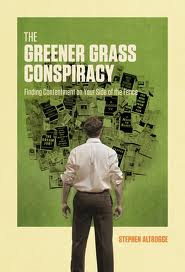 Stephen Altrogge’s goal in The Greener Grass Conspiracy is to wake us up to the seriousness of the conspiracy’s intention: to blind us to the source of true contentment, and cause us to search after cheap imitations that will never satisfy. Stephen Altrogge writes a fresh reminder of some timeless truths: that searching for contentment in anything other than God and the Gospel will fail us. Altrogge provides a disclaimer at the start of the book, acknowledging that this is a glorious subject that could be treated at more length. But he tells us that he isn’t trying to exhaust the subject, but merely wake us up to it. He states that the book is more like “notes from the battlefield,” hoping that the reader will “join him in the fight” (14) against the conspiracy. Altrogge acknowledges right off that he borrows most of his ideas from John Piper’s God Is the Gospel, and that there are other more lengthy treatments of the subject of contentment, and of God as the source of all contentment and happiness. Altrogge provides a great jumping-off point for us in the matter of contentment, writing an appropriately concise exposé of the conspiracy within us, and against us in this fallen world, to blind us to what true joy and contentment mean. Altrogge starts his argument in the right place – reminding us of who God is, and how a right understanding of God’s character puts us in our appropriate place. In chapter 1, entitled “Why Am I So Unhappy?” Altrogge gives us an assessment of our situation – that we fail to find contentment because we look for it in the wrong places. Then he shows us in chapter 2, “I’m Not the Center of the Universe,” that the whole universe, including human beings, was created for God’s glory and not the other way around. From there, Altrogge takes us skillfully and honestly through his exposé of the conspiracy, revealing our tendencies to be deceived by the world and by our sin. Altrogge also doesn’t shy away from the difficult subjects of tragedy and trials, showing us that even in those things, God intends for us to find contentment in Him alone. Altrogge ends his “notes from the battlefield” in the appropriate place as well, with Heaven and the hope that God will right all wrongs in the end. He speaks words of good, solid comfort, saying, “we’re still exiled from our home. We’re still waiting for Jesus to return, to conquer his enemies, to reward his disciples, and to create the new heavens and the new earth. When that happens, we’ll be home. We’ll be in God’s place, and it will be everything for which we always longed” (136). One of the great things about the book is the style of Altrogge’s writing. He is personal rather than academic, which makes his message very relatable. He uses numerous anecdotes and illustrations from his own life, and combines solemnity and humor (which is often hilariously goofy, and often self-deprecating) throughout the book. His argument is transparent, honest and relatable, which makes it quite the page turner, and quite fun at times. The Greener Grass Conspiracy is a much-needed, freshly spoken wake-up call to timeless truth. We need the reminder that a source of true, solid contentment, happiness and joy exists – we just need to find it in the right place. Next ›Why read C.S. Lewis?